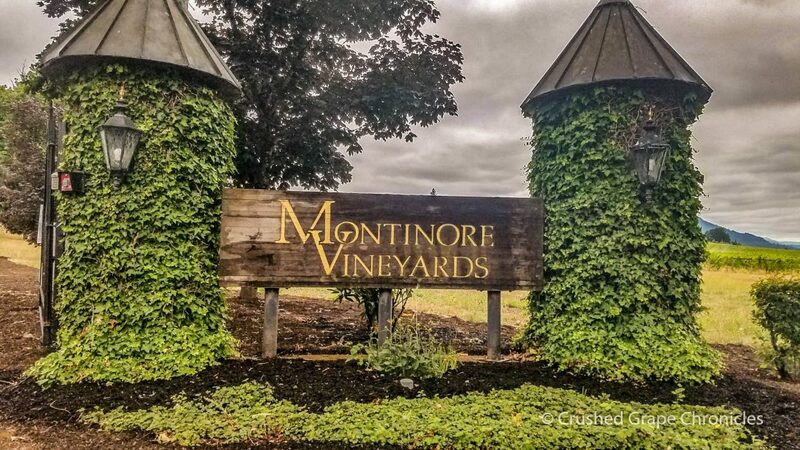 After a wonderful interview with Rudy Marchesi of Montinore Estate discussing the Missoula Floods, the history of Montinore estate and their wines as well as Biodynamics in the vineyard and garden, Rudy invited us to the cellar for a barrel tasting. 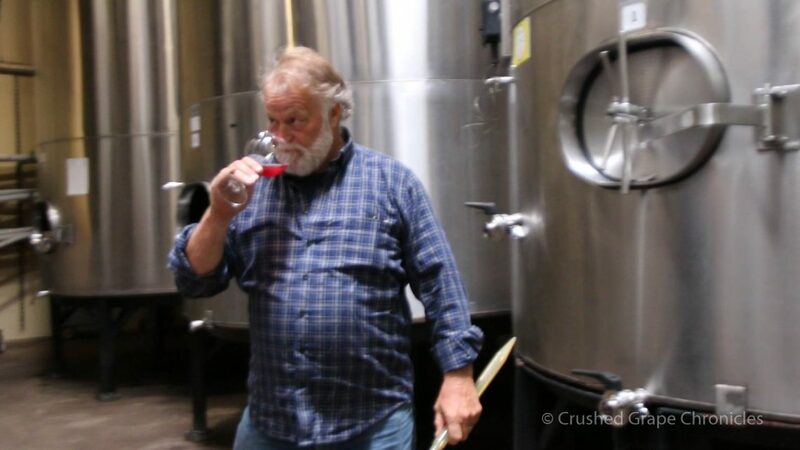 On the way, we went through the lab, where we met Montinore Estate winemaker, Stephen Webber. Stephen started with Montinore as Assistant Winemaker over a decade ago in 2006 coming from DiStefano winery in Seattle. 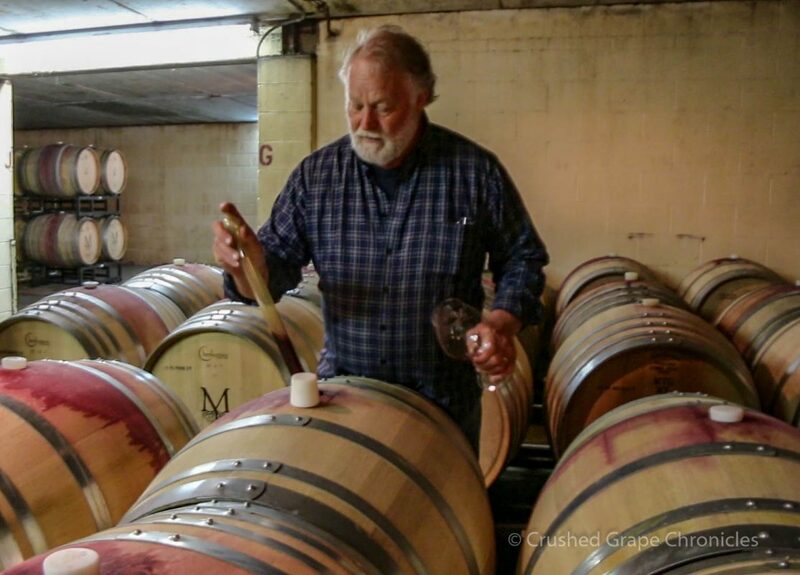 He became the Co-Winemaker in 2009 and took over as head winemaker in 2016. We stopped briefly in the tank room for a taste of the Red Cap Pinot that was fermenting in tank. Before heading to the cellar with room after room filled with barrels and a few clay amphorae style vessels (which we later found out were on loan from Andrew Beckham). 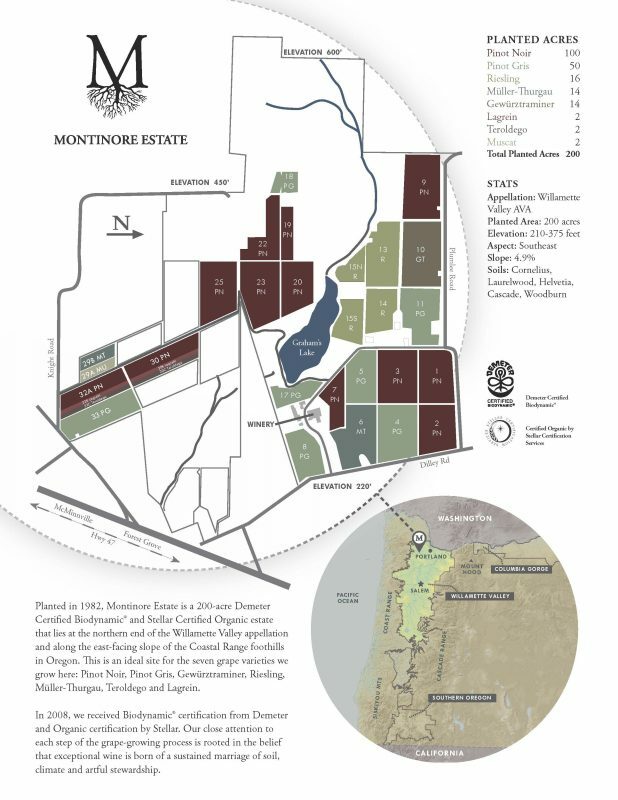 The original plantings of Pinot Noir in the Montinore Estate Vineyard in 1982 were very typical of the early Oregon plantings and were Pommard and Wadenswil clones. The vineyard we tasted from next were some of the first high density vineyards in the area, planted 2500 vines to the acre. Rudy feels high density works better here. With high density vineyards, each vine is asked to do less work. Here, instead of each vine needing to produce 6 lbs of fruit, they are only asked to produce 2 lbs per vine. I remember speaking with Jason Haas about high density vineyards. He was very much against them in Paso Robles. But here is where perspective comes in. High density planting in Central California during a drought is much different from high density planting in Oregon, where moisture is much more abundant. So much of vineyard practice is determined by location and climate and available natural resources. We moved on to taste from another barrel that came from a block about 100 yards from the first. The difference was immediately apparent in nose and color. This was the same elevation. The soil is Missoula Flood loess over basalt. Rudy conjectured that these 35 year old vines had worked their roots into the basalt and this was where the differences came from. This pinot had more earth with herbal and cherry notes. Basalt, Rudy explained, often had this cherry note. The first block we tasted from had deeper loess. He noted that the basalt in Dundee was different, but still had these cherry notes. The Red Cap Pinot Noir is a blend of all of their Pinots. Everything is barrelled separately, then they pull reserves from each vineyard and block and the remaining blends into the Red Cap. The very best blocks make up the estate reserve. They then make several vineyard designate wines. 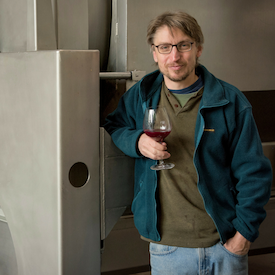 They make 200 cases of a single vineyard Pinot Noir from Parsons Ridge. Which we tasted next. The next wine was from the Tidalstar vineyard which has marine sediment soils. 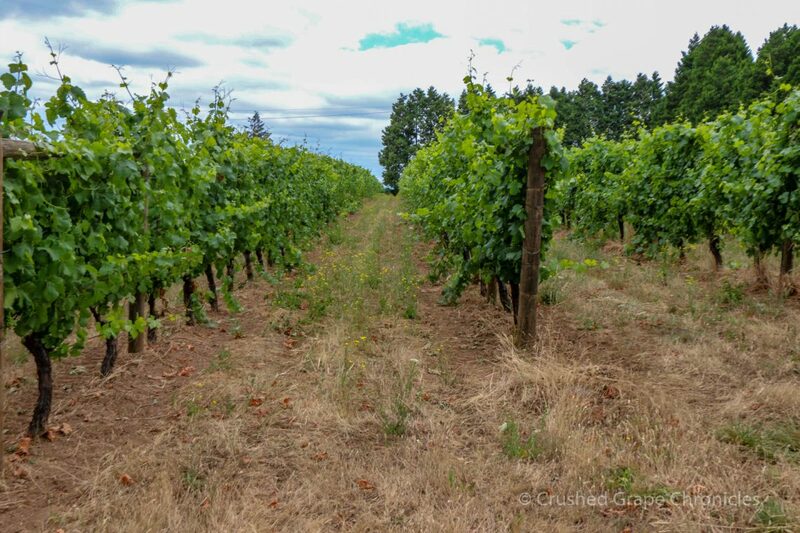 This vineyard is located in the Yamhill-Carlton AVA on it’s western edge. This wine will be part of the Red Cap, as well as all 3 tiers of single vineyard wines. They are thinking of creating a new brand exclusively from this vineyard. Michael commented on this being the perfect way to taste wines. Comparing blocks and soils in the cellar and seeing and smelling the differences, guided by someone who knows the vineyard. This is the beauty of Pinot Noir, it is so expressive. As Rudy searched for the right varieties for his early vineyards on the East Coast, he set up a research project to go to Northern Italy and explore indigenous varieties. His father was born there, so he had some people he could contact. They went to 5 different cultural research stations. He learned quite a bit, but didn’t put it into practice until he arrived in Oregon. We tasted the Lagrein. (disclosure – a varietal I love and find all too rarely). Lagrein’s parentage is Pinot Noir and Dureza (which is also a parent of Syrah). In the glass it is very Syrah like. You can really see in the glass, something syrah like going on. This has been doing well. We just bottled the 2016. I planted these in 2010-2012, so they are just starting to come in stride. We moved on to Teroldego a grape related to Pinot Noir, Lagrein & Syrah. Elisabetta Foradori, she inherited her family winery at 19 or so, they grew Teroldego, at the time it was meh. She went through and selected the best vines and clusters and bred for quality….I got material from her. We only have 2 acres of it, like the Lagrien. But I think it needs warmer sites, this might be our global warming hedge. At this point we came to the beautiful clay fermentation tanks. Clay breathes more than concrete, you can feel it. That’s what we want. I want that evaporation of water through clay just like barrel. In amphorae you get alot more fruit. Pinot producers worry, they get so much fruit…would it have the ageing ability without the tannins from the wood? As a blending component it could be very exciting. Unfortunately, the Clay tanks have no sampling valves. So there was no tasting to be done there. Andrew Beckham is making him several of these clay vessels which Andrew calls “novum”. (these clay vessels are rounded like amphorae but do not have the conical bottom). You will get to hear all about the “novum” soon, as we spent a morning at Beckham and some time with Andrew on this trip also. This was the end of our joyous trip to the cellar with Rudy. He was off to lunch with the grand kids and led us back to the tasting room for a tasting of their wines already in bottle. For his work in Biodynamics and its advocacy, and, more importantly, for his generosity of spirit, OWP is pleased to honor him. I knew of his work in Biodynamics. We spoke with him during our interview about it. But I truly had no idea of what a true leader in this field he is. Here, here Oregon Wine Press! Well done! And well done Rudy. I am humbled at the time and knowledge you so graciously shared with us. The Estate is beautiful. You will find it in the Northwest corner of the Willamette Valley in Forest Grove. Wow what a great experience! I love the focus on the soil and that Lagrein sounds divine! Definitely popping this one on the list for when I’m in the area! 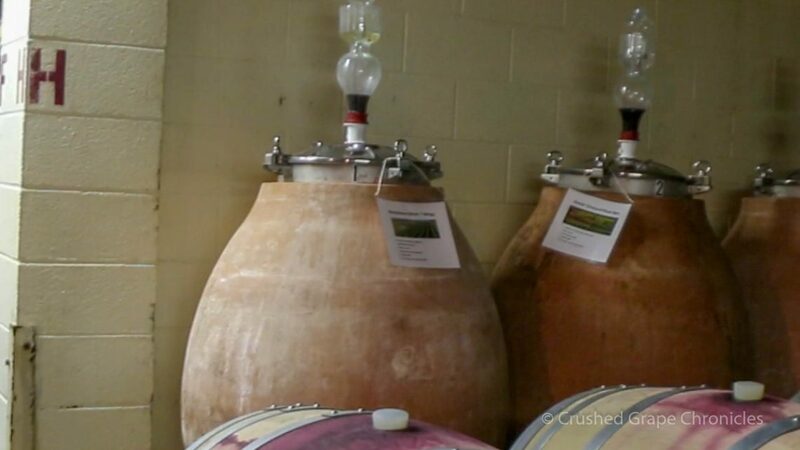 The barrel tasting sounds like a great experience! What a great way to see how the different plot soil conditions impact the wine.